Ultimate Innovation cat litter is ideal to use with the Omega paw roll away litter boxes. 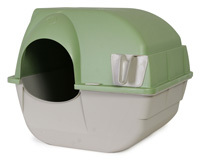 Simply roll the litter box to the right until the top touches the floor and then roll it back to the upright position. The waste will now be in the pullout tray for easy disposal. When placed in front of the cat litter box, STEP 'N GO mats trap kicked litter and also clean your cat's paws. Thousands of soft grasslike blades catch and prevent litter from spreading around the house. Its unique design also traps food and water preventing it from spilling on the floor. Extra strong - enabling it to easily cope with the stirring of litter in the cat litter tray.